Although a fictional city, it does kinda look like San Francisco. Though the city's offical name is "The Small Apple"
I would love to know why the Dreamcast failed. Really I would. You had great graphics, network play, fantastic music, a justifiable expense in a memory card, the ability to handle both 3D and 2D games, and some of the most original games to ever hit consoles. We’ve talked about one so far, Chu Chu Rocket, but there’s another game which ate up pound coins – more than enough to afford a whole Dreamcast with a copy of this game – Crazy Taxi. 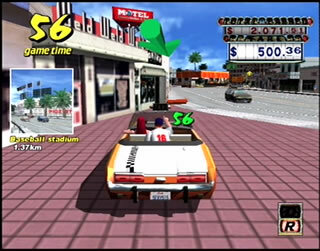 Yes, originally an arcade game, Crazy Taxi was made by Sega’s fabled arcade division and released to an unsuspecting and dwindling arcade public in 1999. Nevertheless, it captured imaginations the world over. Yes, this was a driving game, and yes there was a time limit, and yes you had to drive as quickly and recklessly as possible. However, instead of low times, you are making high fares. You see, there are a variety of people around the map with circles below them, you need to stop by them, find out where they want to go, and get them there as quickly as possible. As this isn’t a normal taxi, but a “Crazy Taxi”, fares decrease over time, so for your bank account you need to get them there. If you do get them there quickly, you also get a time bonus, allowing you to play the game for a little longer. You then pick up the next customer – who will give you a more significant time boost in which to deliver them to their destination. Ad infinitum until you get the highest score you can. It’s classic simple arcade stuff, and is well worth playing, there are few secrets (beyond a “Crazy Dash” & a “Crazy Drift” which gives you a speed boost), but the beauty of the game is the simplicity. It has a fantastic pick up and play that is so desirable these days, but the beauty was the presentation. It was fantastically beautiful, with a kicking soundtrack from The Offspring & Bad Religion, as well as a fine example of product placement in the game, with Pizza Hut, KFC & Tower Records amongst the businesses making an appearance. It isn’t annoying, au contraire, it’s actually quite refreshing, as it gives the fictional coastal megalopolis a sense of reality. 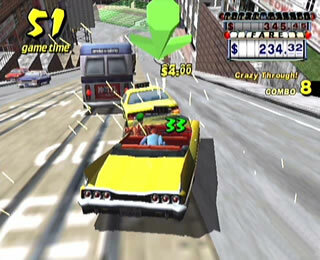 I think inherantly the game fell down on console versions, with nothing really added to it (a huge problem of Dreamcast arcade conversions), but as far as a pick up and play game, Crazy Taxi is one of the best, and even 10 years since the console it was on, and the game itself, was released, it still stands out as a polished, fun and fantastically enjoyable driving game. Be sure to seek out this gem, you’ll be glad you did!